Much more than a cooler… today, a real need! Exclusive features offered by this new concept are protected by international patents. The growing market demand for accessibility to products without ''barrier'' and in FIFO mode, as well as reduced consumption of electrical energy required by the European Directive applicable in 2020, has led us to develop a unique solution for the market. We are aware that fully-open refrigerated units offer the advantage of easy access to the consumer. 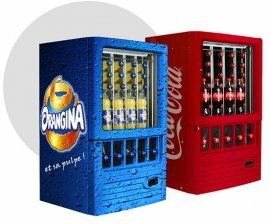 However, these consume a lot of energy, are very noisy, cool the environment unnecessarily and present very high purchase and maintenance costs. 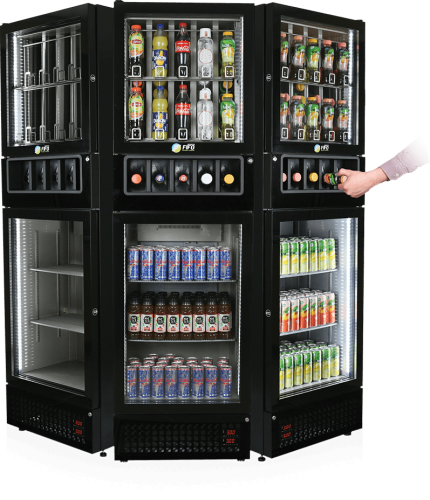 We also understand refrigerated display units, closed by airtight doors, wich the consumer must open to access the stored bottles. This system results in a significant loss of energy and condensation on the glass door each time the door opens. Not to mention the commercial disadvantage of limited accessibility. The FIFO Green Cooler was intended to provide a solution for making bottles more accessible, while offering an ultra simple design without moving parts and thus without the risk of breakdowns. It also offers a dramatic reduction in energy losses by avoiding the air flow from opening doors. This new concept is simply economical, practical, efficient, reliable and environmentally friendly compared to other known refrigerated display cases. After a long period of research and development, it is now developed and manufactured in Europe, and finally available for marketing. Through successful development, the FIFO Green Cooler offers a very high level of quality. It uses the latest environmentally friendly refrigerant gas on the market: Hydrocarbon R-600A. FIFO Green Cooler consistently guarantees its customers the highest level of quality. Warranty: C.E. 2 years for parts and labour. Customize it with your logo and design !